Iconically coloured, friends to farmers and gardeners alike, and named after The Virgin Mary, Ladybirds are undoubtedly the most popular of all the beetles. This book, which originated as a series of articles in the Amateur Entomologists' Society's Bug Club Magazine, recounts how we can discover British ladybirds in their natural habitats through the year. 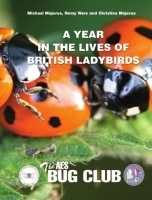 Written by three hugely experienced 'ladybirders', the book provides instructions of how, when and where to find different species of ladybird, how to identify the adults, and facilitates involvement in current research projects on ladybirds. Excitingly, the book sets out ways in which readers can contribute to national surveys of ladybirds, initiated as a result of the recent arrival of the invasive alien harlequin ladybird in 2004. The late Michael Majerus was President of the Amateur Entomologists' Society, Professor of Evolution in the Department of Genetics, Cambridge University, and a Fellow of Clare College. His work on ladybirds spanned over a quarter of a century and he authored several other books on the subject. Dr Remy Ware is a Research Fellow at Peterhouse, Cambridge. She is a leading light in the operation of the Harlequin Ladybird Survey and has written extensively on the potential negative impacts the harlequin ladybird poses to native ladybirds. Christina Majerus is a student at Lucy Cavendish College, Cambridge. She has collected ladybirds and other insects on four continents in an extraordinary array of habitats, from the snowy Canadian Rockies, to the jungles of Malaysia. AES members are eligible for a significant discount on this publication reducing the price to just £4.50. To obtain a discount coupon please see our Members' only area or contact us for details.